The Coventry Winter Farmer's Market was hopping today, and that was a great feeling. I know I go on about this, but I love farmer's markets, the fresh food and the opportunity to buy my food from the folks who grow it...so when "my" market is busy I'm very happy to be among those who are like-minded. I'm told that it was busy last week, too, so there's hope that we've hit a critical mass of people who know that it's there and will come to buy their food regularly. 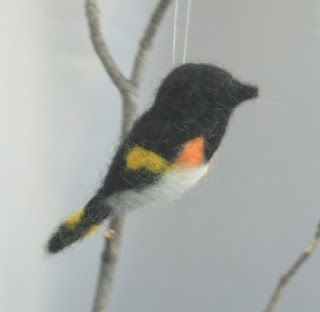 Here's a tiny little warbler. Our breath of spring is gone, it's now sleeting, so I'll keep making springy birds to keep my spirits up. It's hard to know how long this messy weather is going to last, but I need to get my daughter into the Berkshires for the start of the semester either tomorrow or the next day. I hope there's a window of clear roads.